Deliver pure pleasure to an endeared mate of yours with by gifting the individual this Stimulating Bunch of Stunning Blossoms and tether heart-strings between you two. 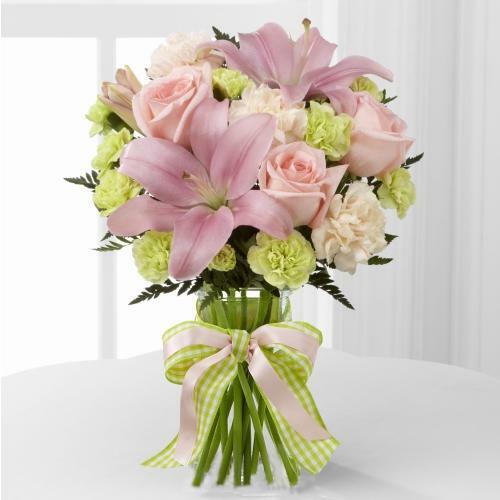 Heart-gladdening Blossoms such as 3 White Carnations, 2 Pink Lilies, 3 Pink Roses and chic Filler Buds constitute this Bunch. Deliver pure pleasure to an endeared mate of yours with by gifting the individual this Stimulating Bunch of Stunning Blossoms and tether heart-strings between you two. Heart-gladdening Blossoms such as 3 White Carnations, 2 Pink Lilies, 3 Pink Roses and chic Filler Buds constitute this Bunch with Small Cadbury Celebration. Deliver pure pleasure to an endeared mate of yours with by gifting the individual this Stimulating Bunch of Stunning Blossoms and tether heart-strings between you two. Heart-gladdening Blossoms such as 3 White Carnations, 2 Pink Lilies, 3 Pink Roses and chic Filler Buds constitute this Bunch with 1/2 kg Black Forest cake.